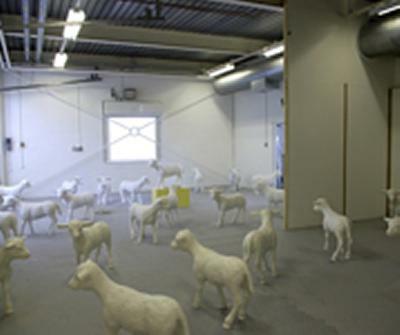 A flock of sheep cast from soap and a sound installation offering encounters with unseen spaces are just two of the thought-provoking artworks being showcased by talented artists at the University of Southampton's School of Art next week. The MA degree show at Winchester School of Art features the artistic outputs of a year of hard work by students who have studied for Masters degrees in Fine Art and Design at Winchester School of Art over the last twelve months. New Zealand-born sculptor Stephen Davies - who has created the cast soap flock of sheep - works with casting, photography and video projection and explores the ways in which we construct our identity through the filter of nationality. Communication design students will be showing off their design, illustration and advertising projects. Some of the work on display has been created for clients, including the production of sleeve artwork and design for a New York-based band, while some students are exhibiting branding, websites and promotional materials they have developed for the launch of their own companies. One such student is Amrit Ghatora (21) from Solihull, West Midlands, who is setting up a new designer brand called New Soul which will sell cool clothing designs printed onto high quality garments, stickers, badges, toys, artwork and other items. Amrit has designed the New Soul logo, website and brochure as part of his final major project. Fine art student Sue McLachlan's sound installation explores spaces we cannot see, can hear and may want to see, but which often become distorted through our visual sensibilities. Sue was one of a number of students and academics who took part in a series of sound seminars organised by the University's Schools of Art and Music earlier this year. Working alongside internationally-renowned artist Lucy Gunning, it was a chance to gain insights into new ways of thinking and working. Dr Beth Harland, Director of the WSA graduate school, said: "This is an accomplished and thought-provoking show, which represents the culmination of an intensive and challenging period of study for all these students. "I'd like to congratulate them all on their enormous achievements over the last year and look forward to following their future progress as leading lights in the creative industries. Students on the communication design course have already enjoyed a variety of high-profile work placements including a summer placement at the Telegraph newspaper and a three-month stint at an advertising agency in Miami." The MA degree show runs from Friday 5 September until Wednesday 10 September at Winchester School of Art in Park Avenue. Opening times are 10am to 4pm Monday to Friday and 10am to 2pm Saturday and Sunday. On Wednesday 10 September, WSA is hosting an MA open afternoon for anyone interested in finding out about post-graduate study at Winchester School of Art. Digital images of work by Stephen Davies and Amrit Ghatora are available from Communications on request. We have over 22,000 students, around 5,000 staff, and an annual turnover in the region of £350 million.